Fixed star Canopus, Alpha Carinae, is a 0.7 magnitude white star located in the Keel of the Ship, Argo Constellation. The traditional name Canopus is a Latinisation of the Ancient Greek name Κάνωβος (Kanôbos). Its name comes from the mythological Canopus, who was a navigator for Menelaus, king of Sparta. 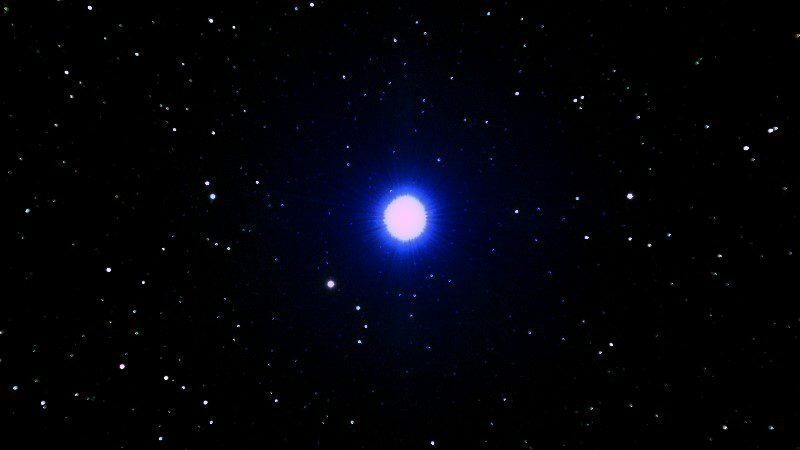 Canopus is the second brightest star in the night-time sky, after Sirius. Canopus’s brightness and location well off the ecliptic make it popular for space navigation. Many spacecraft carry a special camera known as a “Canopus Star Tracker”. Canopus, α star of Carina the hull, and once the α of the whole ship, is a truly brilliant sight, but 53° below the equator. 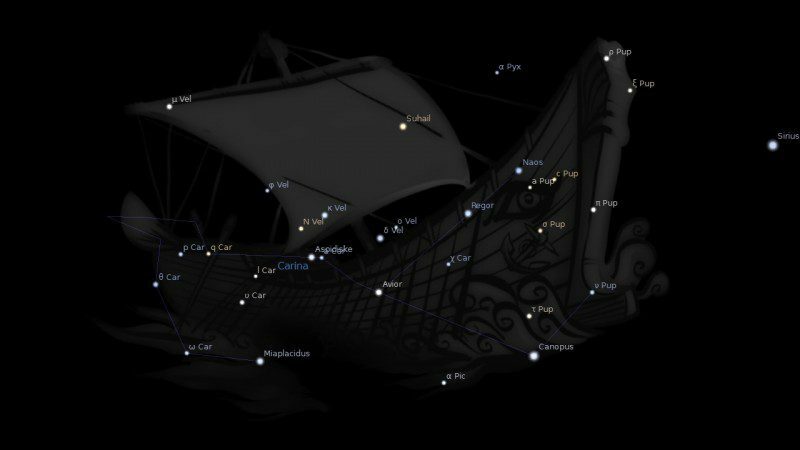 Honored by Ptolemy with a Saturn-Jupiter simile the name has two possible origins: first, Canopus, or Kanobos, was the chief navigator of the Greek fleet that sacked Troy, 1183 BC, and who died near Alexandria, Egypt, some years later. A monument was erected to him there, and in fact a town was renamed after him. The site is close to the present Aboukir, scene of famous naval battles ever since. In due course, it is said, it was Ptolemy who named the great star in Argo after him also. 2. Fixed Stars and Judicial Astrology, George Noonan, 1990, p.67. 3. Fixed Stars and Their Interpretation, Elsbeth Ebertin, 1971, p.32. 4. The Living Stars, Dr. Eric Morse, 1988, p.161. 5. The Fixed Star Health and Behavior Imbalance, Ted George and Barbara Parker, 1985, p.48. Canopus is conjunct my Ascendant. Just love it. How would you read Canopus’ influence if there is a conjunction or stellium but only one of the planets is within orb? The Stellium should increase the orb for the fixed star as it does for the planets. You might also have to consider Sirius. Yeah, Sirius is within orb too and one of the planets involved in the stellium is the almuten. I’m tired of this life. I don’t use horoscopic rules like altumen, see Precession Astrology. Sometimes people who have had many incarnations can feel this way at times. Are you going through a rough patch with transits? position is 7° short of Sign Virgo (Kanyā). Any thoughts on Canopus conjunct the IC (16*02 Cancer), opposite Uranus (15*19 Capricorn), MC, and Neptune (16*53 Capricorn)? This is my chart, and my mother’s Ascendant is conjunct my IC, so Canopus conjuncts her Asc (and the asteroid Dejanira in her chart). You’re not kidding with those legal problems. ???? No you won’t find any star conjunction to the IC. I would think the “piety, conservatism, a wide and comprehensive knowledge, voyages and educational work, and changes evil to good” may apply to your maternal ancestry or your past lives. Perhaps the Midheaven interpretations also. thanks so much for replying ! was adopted at 3 months old so dont get to know of my ancestry .didnt gain access to my birthtime until oregon released my right to get certificate of live birth for adoptees a few years back .since then ,its opened a ton of doors learning my astrology …learning something new every day !